The next big PDC event on the sporting calendar is the Champions League of Darts which is set to be broadcast on the BBC on September 22 and 23. While we await betting prices — and indeed any action whatsoever this week — we give you a sneak peak as organisers have made the draw for the tournament that will be played in Brighton one month from now. After the first two editions of the Champions League were staged in Cardiff the tournament has now relocated to the Brighton Centre to replace Brighton’s hosting of a Premier League night. Locals will now have the pleasure of seeing the PDC’s leading eight players all competing in a live televised event. At the draw, the chairman of the PDC, Barry Hearn, talked of his pride in bringing the tourney to the South Coast and how popular the event has now become. The draw itself threw up some great opening ties. World number one Michael van Gerwen was naturally seeded in Group A and is joined there by recent World Matchplay winner Gary Anderson, 2017 World Grand Prix champion Daryl Gurney plus Dave Chisnall. UK Open champion Peter Wright finds himself in Group B with world champion Rob Cross, reigning Champions League winner Mensur Suljovic and former European Championship winner Simon Whitlock. 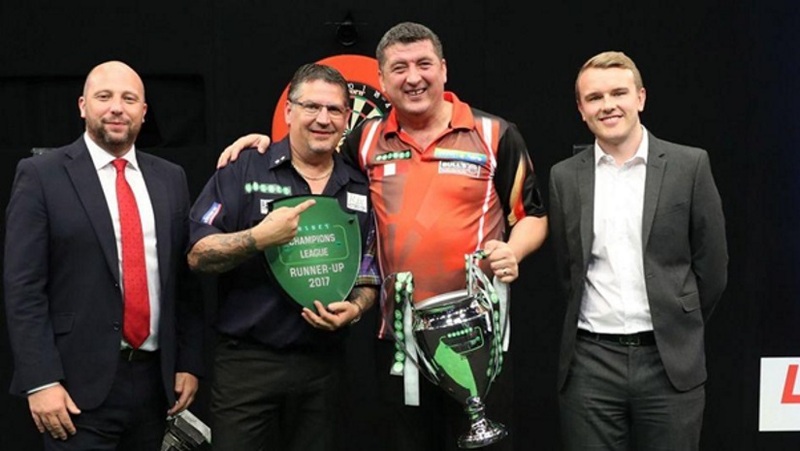 This means that in the opening match of the 2018 event Mensur Suljovic will face-off against world champion Rob Cross, who will be making his Champions League debut. This match will lead into Peter Wright going head to head against Simon Whitlock, followed by a Gary Anderson and Daryl Gurney battle and lastly, Michael van Gerwen versus Dave Chisnall. The round-robin phase continues in the second session on Saturday evening before play carries over into Sunday afternoon, where the top two players from each group will compete for the title in the semi-finals and final. There will be four matches consisting of the winners of the first group plus the two losers from both groups. There will be four matches consisting of the remaining group matches, deciding on the top two qualifiers from each group. Two semi-finals plus the final. World Champion Rob Cross made it six winners from six events in the World Series so far in 2018 after he defeated Michael van Gerwen 11-6 in the final of the Brisbane Darts. 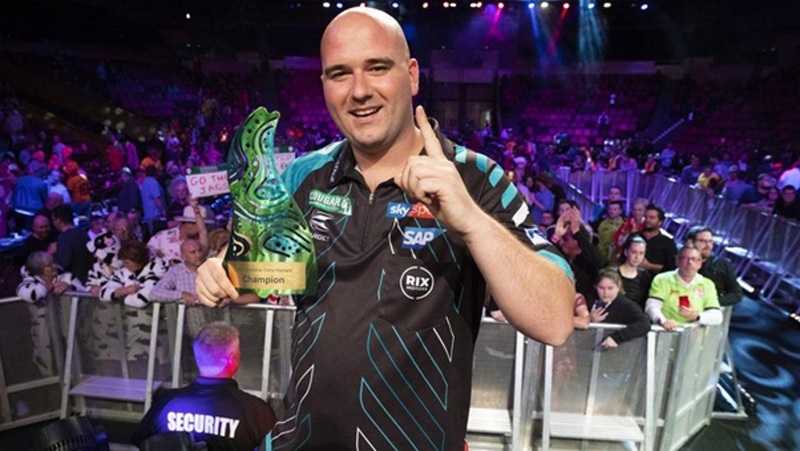 In a repeat of their World Championship semi-final last winter, Cross faced the world number one, MVG, in Sunday’s final event of the PDC’s Down Under tour and came out on top just like we called last week. For Voltage, it was his first televised title since his victory at Alexandra Palace in January and also his first ever World Series Crown. Cross opened the best of 21-leg match poorly, missing two darts and allowing Van Gerwen to step in and break, before a 114 finish from the Dutchman in the follow-up leg put him ahead. Voltage responded by starting his comeback with a run of four legs in a row, which included a brilliant finish of 130. The running streak was ended emphatically when Mighty Mike took out 170 for a 12 dart break and then retook the lead a 130 finish of his own. From the mid-point of the match, Voltage began to take charge going on to land six maximums while reeling off a run of seven straight legs to finish with an average of 106 in what was a truly impressive performance from the World Champion. In truth, he had dominated Van Gerwen, the World Series’ most successful ever player, for most of the match, giving a performance that was more than enough to secure the title at the Brisbane Convention and Exhibition Centre. Earlier on in the evening, Van Gerwen defeated his countryman Raymond van Barneveld 11-9 to reach the final, while Cross secured his place in the final with an 11-8 win over Peter Wright in the semis. The World Series concludes in Vienna in November where the final events will run over three days. The players now enjoy a week off to get over their jet lag before the German Darts Championship take place from August 31st to September 2nd. 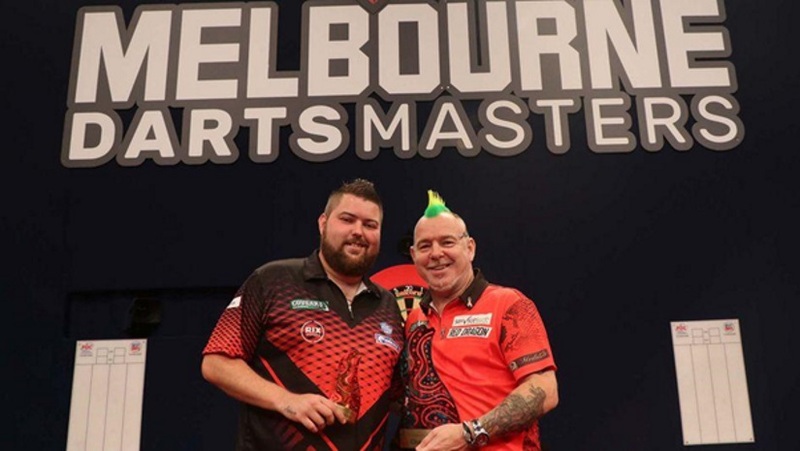 Peter ‘Snakebite’ Wright returned to his winning ways last weekend as he beat Michael Smith in Sunday’s final to take down the Melbourne Darts Masters title at the Hisense Arena, one round after beating Mighty Michael van Gerwen in the semis one round earlier. Wright now becomes the fifth World Series winner after five events in 2018 after Michael van Gerwen won in Auckland a week ago, the first of three Antipodean-hosted World Series events, the next of which takes place this coming weekend in Brisbane. Your other 2018 winners are Gary Anderson, who won Las Vegas; Mensur Suljovic, who won the German Darts Masters back in May; and this week’s losing finalist, Michael ‘Bully Boy’ Smith, who claimed the Shanghai Darts Masters in July. Wright, who won the 2017 German Darts Masters, now scoops his second World Series title after overcoming Michael Smith 11-8 to end his run of bad form in which he hadn’t won a televised final in 2018. Even more perversely, in 2017 he become only the fourth man ever to win 10 during a calendar year, demonstrating just how far he’d fallen this season. His return to form came in earnest when he overcame last week’s Auckland Darts Masters champion Van Gerwen 11-5 in the last four, a win aided by a sloppy MVG firing three successive darts into the bullseye as his usual poise deserted him. In the evening’s other semi, Smith defeated the third seed, Gary ‘The Flying Scotsman’ Anderson 11-5 to make the final. During said final, Wright averaged around two points less than his rival as he banked 97 under 99. For the rest of the match they were almost inseparable, matching each other almost dart for dart and throw for throw, scoring five 180s and two ton-plus finishes each. The deadlock continued for thirteen sets before Wright finally made a breakthrough and landed a 130 checkout to break throw and take the 14th leg to lead 8-6. Once ahead, Wright found his rhythm to score a third break in a row with a 131 as part of a 12-darter. This was followed by a 15-darter to hold his throw and take down a 10-7 margin. By the time he returned to the oche, all he had to do was close out the 11-8 win. The players now head to Queensland to compete for the inaugural Brisbane Darts Masters from August 17-19 at the BCEC. For those that fancy Peter Wright to pick up where he left off, you’ll be pleased to know that Betway have placed an 8/1 price on his head to win outright in Brisbane. Remember, though: we have had five different winners from five events. If you’re looking for a new name this time around then your best bet would seemingly be Rob ‘Voltage’ Cross, available at 11/2. The 8/11 favourite is, understandably, Michael van Gerwen, just ahead of Gary Anderson’s 11/2. It’s the Scotsman who gets our money this week. Michael Smith — winner in Shanghai — is at 14’s, while the Aussie pair of Corey Cadby (22/1) and Simon Whitlock (33/1) are considered outside chances, as is Raymond van Barneveld at 28/1.